The EU pig price continued increasing during March with the reference price increasing €6.70 to average €142.62/100kg. The EU-28 price was €150.01/100kg in the week ended March 31, the highest weekly price since the beginning of September 2018. Price increases were seen in most countries over the last four weeks with the largest increase in actual terms seen in Poland, up €20.90 to €149.73/100kg. Other nations reporting sizeable percentage increases in prices were Denmark, up 6.2%, Germany 10.7%, Spain 8.5% and the Netherlands 9.5%. 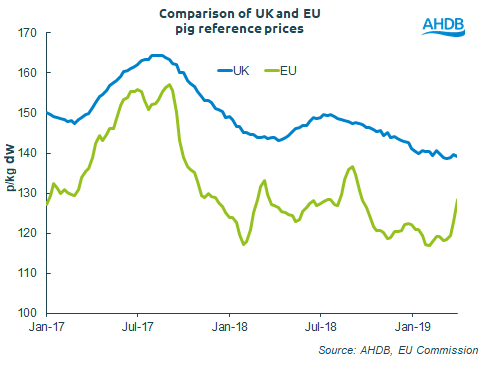 AHDB analyst Jennie Tanner said: “Compared with a year earlier, the EU average reference price is 4% higher, or €5.11/100kg, with reductions in some countries countered by even stronger prices elsewhere. Most notable are a 7.2% increase in Germany and an 8.8% increase in Denmark.